» Do Trade Rumors Help Rajon Rondo? If you want to know whether the Boston Celtics will truly squash the trade chatter in the light of Rondo’s bonkers performance — then, sorry, that’s not so clear. But if you want to know whether Rondo really does play better when he’s pissed off — well, we can try to find an answer for you. Thanks to his oddly uneven skill set and his, shall we say, tempestuous nature, Rondo has found himself in the middle of more speculative trade talk than the USITC. (It’s a quasi-judicial federal trade commission. It provides information on matters of international trade and competitiveness. Um, never mind.) So, does he actually perform better in the midst of trade rumors? Does he truly use rage as fuel? Has Ainge been maniacally incepting Rajon Rondo for years?! Let a reverse chronological breakdown shed some light. The Rumors: ESPN’s Chris Broussard reports that, once again, the Celtics are “aggressively trying to trade Rajon Rondo.” Also, once again, everyone maybe hates him: “Celtics find Rondo’s personality to be too high-maintenance and his clashes with coach Doc Rivers remain an off-court distraction.” The specific targets for Boston include the Lakers’ Pau Gasol and the Warriors’ Stephen Curry, with the latter trade either not happening because Golden State straight balked, or because Boston was concerned about Curry’s history of ankle injuries. The Reaction: He lays down a monster! In 48 minutes of action (plus every minute of OT) against the Knicks on Sunday, Rondo tallies the aforementioned 18 points, 17 rebounds, and 20 assists, and tacks on a steal and a block for good measure. The last guy to get a triple-double with 17 or more in three statistical categories? That’d be Magic Johnson, back in 1989. (And not since 1968, when Wilt did it, has anyone gone for 20 or more in three categories.) Making it more impressive was the fact that the Celts needed every last one of Rondo’s manifold statistical achievements to claim victory in what was another tight New York-Boston battle. This seems like a good time to note that Rondo has long made a habit out of showing up to high-profile games, whether or not the high-profile-ity of them has to do with a rumored end of his Celtics tenure. As Sean Grande writes: “13 of Rondo’s 17 career triple-doubles have now come in nationally televised games. Last year, his season-high 26-point game was on national TV, as were 6 of his top 8 assist games. In 2010, Rondo’s top two rebounding games, 13 and 11, both came in, yep, national TV games. And in 2009, his 32-point destruction of Steve Nash, which was his career-high until two weeks ago, was a Sunday afternoon ABC game.” Also: You should see just how he turns up his roller-skating when the pressure is on! 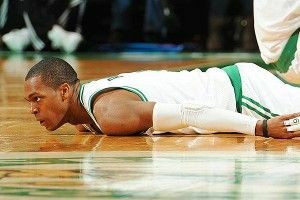 The Reaction: Because of the NBA lockout, it’d be several weeks before Rondo could respond on the court. But when he did — in the first game of the season against the Knicks on Christmas Day — it was another valiant effort: In a Celtics loss (Paul Pierce wasn’t back in the lineup yet), Rondo tallied 31 points, 13 assists, five steals, and five rebounds. The Rumors: OK, so this particular entry has nothing to do with trade rumors, but bear with me for a minute. Last February, Rondo’s pal Kendrick Perkins — remember, they were the two young guys starting alongside the Hall of Fame Big Three — was traded to the Oklahoma City Thunder. The move broke up the starting five that had won a title in 2008, and shocked fans; it’s probably fair to assume that Perkins’s teammates didn’t really see it coming, either. So, yes, this time we’re talking about the effect not of trade rumors on young Rondo, but rather the controversial trading of his center. How would Rajon — who, and I really don’t know if anyone has ever mentioned this to you before, can just be kind of moody sometimes — handle it? The Reaction: Not well! The next game after the trade, the Celts played the Clippers, and Rondo had 11 assists alongside seven turnovers. Also, in 34 minutes, he only shot the ball twice. It was a harbinger of the rest of the season. Sporting News reports: “Before the trade, Rondo averaged 10.8 points on 50.9 percent shooting, with 12.3 assists. After, he was down to 9.8 points on 41.6 percent shooting, with 9.2 assists.” Some troubles, it turns out, Rondo’s not so great at playing through. The Response: Again, Rondo had to wait a while until actually getting on the court. Once he did, in the season opener against the Cavs, he had himself a stellar, if unspectacular, Rondo performance: 4-of-8 shooting for eight points, 10 assists, six rebounds, and three steals. And Boston did win, shutting down the then newly minted Shaq-and-LeBron show in its first outing. But, as the Sporting News speculated, that summer’s grip of trade talks might have had less to do with spurring on-court performance as it did with bringing Rondo’s price down. That offseason, Rajon was negotiating his extension, which ended up being the highly reasonable $55 million for five years.